“What? 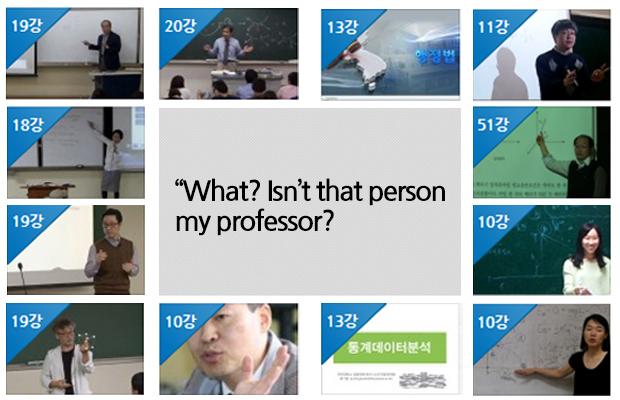 Isn’t that person my professor?” It has been a year since the professors of Kookmin University took video for online lecture. It is possible to review the topics missed in the lectures and class materials. 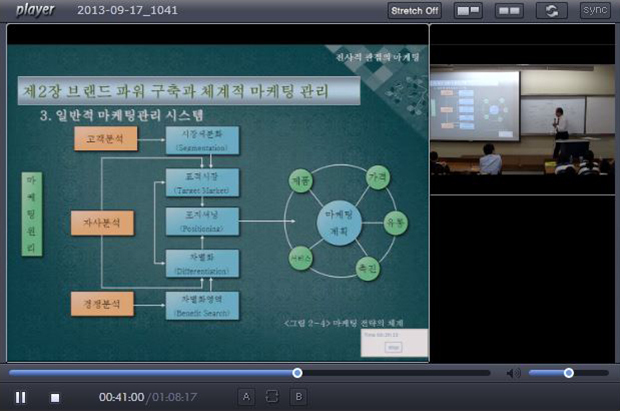 Also, anyone outside the university can access the quality lecture of Kookmin University. The name of this system is Kookmin Open Course Ware (hereinafter Kookmin OCW). *OCW is a free teaching and learning resource with open license for quality educational materials. It allows anyone to access the free teaching and learning materials; thus, it is different from cyber lecture that approves credits by taking courses. Started by MIT, OCW has been provided by world-renowned universities and Kookmin University started the service from September 2013. Kookmin OCW newly reorganized the site in September 2013 and since then, lectures are recorded and provided from 18 lecture halls in the university. According to the feedback on 1-year of OCW service, there were positive responses and in consideration of such feedback, 9 more cameras will be additionally installed in the second semester; therefore, total of 27 cameras will record various lectures. Currently, total of 856 lectures from 46 subjects are uploaded. The special lecture on Thursday has been settled as a popular elective course of Kookmin University since a socially recognized invited figure provides special lecture and it is also available for free without log-in. You may think that this free lecture service is good for non-students or students from other universities. But it is only half of the advantages provided by the Kookmin OCW. 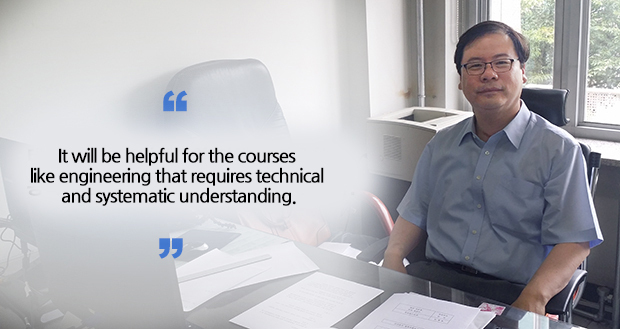 Since Kookmin OCW provides lectures from actual courses, it is beneficial to Kookmin students. If you once worried about whether to take a certain course but there is no one who previously took such course, the Kookmin OCW can guide you. You can register for a course after taking the online lecture that you want. Also, you can review the parts that you missed in the actual lecture after going back home. ▲ It allows PPT split screens that show many screens at the same time. Expanded open lecture is welcomed among professors. Regarding the loose class attitude due to such easily accessible service, Professor Yi said it would be overcome by increasing the attendance ratio for the overall academic evaluation. He said that he feels some pressure to the tight schedule for each lecture but since the examples and cases introduced in the lecture help facilitate better understanding, the students can relax and focus more on the lecture. If the teaching personnel become passive on providing such class details, appropriate teaching method based on the open lecture service should be developed. Professor Yi said there are pros and cons when a new idea is introduced, but it is foolish to prevent something good due to the fear of cons. If you wonder about lectures of other universities? 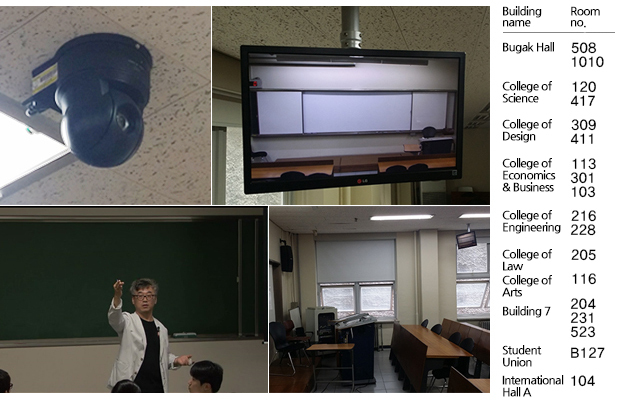 Opening the lecture sources through OCW is actively promoted not only in Kookmin University but also in other universities worldwide. If you wonder about the lectures of other universities, utilize KOCW and SNOW. KOCW is the abbreviation of the Korea Open Course Ware and as its name implies, it provides the most extensive academic resources of Korean universities including 4,762 lectures in connection with 151 universities across the nation. 30 lectures of Kookmin University are also listed. In SNOW, it is possible to take courses of world-renowned universities such as MIT, Harvard University, and Yale University. 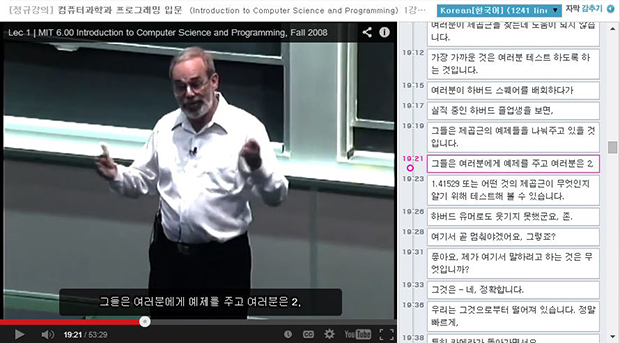 As Korean subtitles are provided, it is okay to take any course. Also, it is convenient to download the Korean and English text of the lectures. Meanwhile, online lecture is uploaded not to the Kookmin OCW but to the cyber university depending on professors’ decision. In this case, only the course-registered student can access the online lecture. To compare with Facebook, it can be made available to everyone or limited only to friends. It can be interpreted that more lectures are recorded than the ones registered in the homepage. When registering courses, the time as well as the lecture room must be considered. If you take a course in an on-cast lecture room, you are given additional opportunity to review the class materials to get better credits.